Progressive design, serene day-to-day driving and off- road capability: easily handling various automotive applications, the all- new Mercedes-Benz GLA impressively reinterprets the compact SUV segment. It effortlessly masters day-to-day driving and is also robust enough for off-road excursions. The first Mercedes-Benz in the fast-growing compact SUV segment is highly maneuverable around town lively on country roads and athletic and efficient on the highway. The high- quality appointments, developed with much attention to detail, and the versatile interior clearly position the GLA as a premium compact SUV. The muscular and imposing appearance of the exterior is systematically continued into the interior. This has an especially high-quality feel that is achieved by the contours, choice and combinations of high-grade materials. All trim surfaces are galvanized in silver-shadow for material authenticity, resulting in a metallic finish with a “cool-touch” effect. The impression is one of perfect detail. The heavy emphasis on horizontals, the dynamic design and the highly attractive design features are other high-quality attributes. The same applies to the great precision of joints and gap dimensions. The dashboard consists of an upper and lower section, allowing surface structures that are different in look and feel. Matte and glossy 3D geometries (graining) create an attractive light effect. The three-dimensional trim section of aluminum or wood lends a new, modern touch to the interior. The available matte satin finish of the wood trim is a further enhancement to the modernity, and makes the surface especially pleasant to the touch. The good air flow characteristics, which are a major factor in the vehicle’s low fuel consumption in everyday conditions, result from numerous aerodynamic optimization measures. These include a low A-pillar step with suitable geometry and aerodynamically optimized exterior mirror housings. The rear end is also streamlined. The measures here include the roof spoiler lip and the aerodynamically shaped tail lights. Rear spoilers at the sides ensure that the airflow breaks off for optimal aerodynamic efficiency. Seals in the front bumper (radiator area incl. around the headlamps) round off the aerodynamic measures. efficiency. 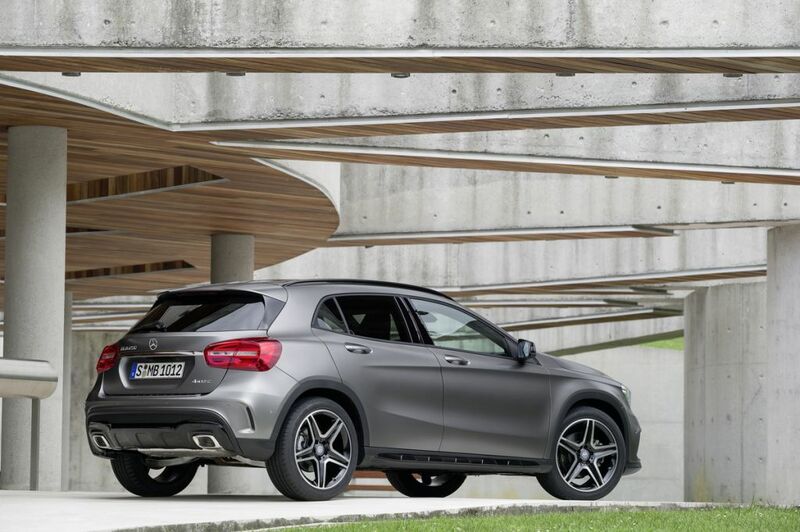 The new GLA also takes the lead in its segment with its dynamic performance figures. The 2015 GLA250 4MATIC features a turbocharged 2.0-liter gasoline engine that generates 208 hp and 258 lb-ft. of torque. The GLA250 4MATIC sprints from zero to 60 mph in under an estimated 7.1 seconds underlining the dynamic claim to leadership of the GLA. It has a top speed of 130 mph. The engine is mated to a 7-speed dual clutch automatic transmission which unites comfort and sportiness. The front-wheel drive GLA250 will be available in the U.S. in spring of 2015. With the new GLA Mercedes-Benz is adding a new member to the successful SUV family. This compact model reinterprets the SUV concept in a new, modern way, because the GLA is less imposing than previous SUVs, and therefore fits perfectly into the day-to-day urban lifestyle. At the same time the optional 4MATIC all-wheel drive, the robust body structure and the variable interior concept guarantee plenty of recreational enjoyment. Motto: away from the daily routine. Rough terrain – the beach, loose ground, dirt roads, off the beaten path – all of these are no problem for the GLA. The GLA has an extremely rigid body, and therefore the basis for stable and safe handling characteristics both on and off the road, as well as a high level of NVH comfort. There are additional reinforcements to the B-pillars, front damper domes, side members and underbody. The components of the 4MATIC system include the power take-off to the rear axle that is integrated into the 7-speed dual clutch automatic transmission, and the rear-axle gear with integrated, electrohydraulically controlled multi-disc clutch. This set-up allows fully variable distribution of the drive torque between front and rear axles. Additional benefits of this design are a lower weight than is available from the competition, and high efficiency. When the off-road transmission mode is selected using the transmission mode switch, the gearshift points and accelerator characteristics are modified so that the requirements for driving on light off-road terrain and especially loose surfaces can be met. Both combination with the standard CD audio system with USB Port, Bluetooth connectivity and HD Radio or optional COMAND system, the head unit can also be switched to an off-road display. The steering angle, the selected off-road transmission mode and a compass are displayed there. The roll angle in degrees, the gradient in percent and activation of Downhill Speed Regulation DSR are also indicated. The latest multimedia generation deployed in the GLA boasts new functions and a modified graphic color scheme. Like all models in the Mercedes-Benz lineup, the GLA comes with the brand’s acclaimed connectivity service mbrace, providing users with an extensive range of online and concierge services and apps all linking seamlessly to smartphones for use inside and outside the car. By using cloud technology, mbrace is always up to date and offers users wide-ranging and flexible access to content.